The days of the befuddled teacher struggling to simply turn on the VCR have long since come and gone in the world of education. Teachers today must have a mastery of technology to connect with students, provide expanded learning opportunities, and collaborate with their fellow teachers. The use of education technology in the classroom is an ever-evolving concept, and teachers must stay on the forefront of new developments to ensure the proper implementation of technology. To help teachers stay up-to-date, universities offer master’s degree programs in educational technology. How will a graduate degree in educational technology help me as a teacher? The reality of education today is that the field is a rapidly shifting landscape. Schools offering master’s in educational technology programs recognize this shift and help teachers gain an assortment of technological skills to take advantage of. Because students have embraced technology at a quick pace, teachers who understand the benefits of technology can connect with students on a deeper level. Students spend more time than ever on computers and on the Internet, so teachers should work to capture student attention by integrating these technologies in the classroom. Coursework in educational technology helps inform teachers about the options available to them, such as creating websites, identifying online resources, and training for in-class teaching aides like interactive whiteboards. Teachers in educational technology programs study how introducing multimedia elements into the classroom captures the attentions of their students, and provides them with interactive opportunities to learn. After completing a master’s program in education technology, a teacher might build a class website that offers students games or videos as study aides. Programs in educational technology heavily emphasize the planning and development of technology-based classrooms, and offer teachers courses in leading that technological change in the school. Teachers who complete these programs are better able to help their less tech-savvy coworkers design and develop class websites, study games, interactive videos, and computer-based projects. Graduates of these programs look at how to integrate technology into existing research and theories in curriculum, instruction, and assessment. With a clear understanding of how computers can help sort students by grades, goals, or learning level, teachers are better at charting out solutions to problems and documenting effective teaching strategies. Chart and research data points in the classroom using assessment technologies to ensure you’re using the best teaching practices possible. 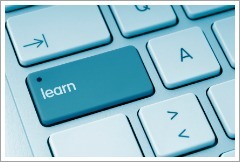 Explore ways to train other teachers to be more technically competent. Study a variety of technologies that enhance teaching practices in the classroom. Teachers focus on learning to design and develop multimedia projects for their students, learning how to create effective visual materials to compliment their teaching practices. Gain an understanding of the history of the personal computer, and how it’s become a widely-accepted tool for education. The advent of the Internet has provided ample learning opportunities for students. Unfortunately, the openness of the Internet has also provided ample opportunities for misinformation. Learn the best ways to train your students to effectively utilize websites for education. Teachers who earn graduate degrees in educational technology might also encounter more opportunities for career advancement. While educational technology degrees are perfect compliments for a traditional teaching position, teachers might also become instructional designers at their schools, helping to re-focus curriculum and coursework toward a more technological view. As students continue to embrace technology, more teachers will need educational backgrounds in the area to integrate this interest in the classroom. How will a graduate degree in educational technology help my students? Consider how often we use technology in our everyday life. According to one study, students spend nearly 50% of any leisure time playing or browsing on a computer. Why not embrace that interest in the classroom? Students able to study, complete coursework, and play educational games over computers might become more interested in the material. Teachers who earn master’s degrees in educational technology have the tools needed to create these materials and re-capture the attentions and motivations of their students. As technology marches forward and the world becomes increasingly reliant on computers, the Internet, and other advancements, more students will need to become technologically competent. If you’re interested in learning more about what a master’s degree in educational technology can offer you and your students, contact and research schools offering graduate programs. Pick your state from this map representing Master’s in Education programs throughout the country.